This week we were driving back from Whitstable and stopped to charge at the Clacket Lane Services on the M25, only to find that our Electric Highway membership card could no longer be used. Instead, we would have to install the Electric Highway phone app in order to charge. This wasn’t a big problem for us because we had Android phones and good signal with a data connection, but if we hadn’t had an Android or Apple phone or a good data connection then we would have been in a bit of a pickle. Apparently you can also now pay over the phone, but only during working hours Monday to Friday, which wouldn’t have helped much. So my first reaction was mixed feelings, because I strongly welcome the introduction of the phone app because it increases accessibility for many people, which is something that I have talked about before. But there will be people for whom it isn’t suitable and places where it isn’t practical (e.g. underground chargers), so some sort of 24/7 alternative should really be provided even if it is just an automated phone line. Hopefully this is just a short term thing and that they will iron this out before to long. What this change really represented though was the end of the era of free motorway charging for many people. It will remain free for Ecotricity customers, but will now cost £6 for a 30-minute session for everyone else. This is an incredibly shrewd move for Ecotricity who have invested heavily in developing the infrastructure and now need to make it commercially viable. Not only will the chargers themselves be a revenue source, but no doubt it will encourage large numbers of electric vehicle owners to switch their home energy supply to Ecotricity. We started considering a switch almost immediately, even though we love Good Energy and really don’t want to leave them. Later in our journey we met a van driver at Fleet who had already switched his home energy to Ecotricity as a result of the new pricing, because otherwise it would cost him £90 a week to charge his electric van on the Ecotricity network. That’s still about 30% less than he used to spend on diesel, but nevertheless it is a lot of money. So many people like ourselves will have to work out whether we will use these motorway rapid chargers enough to make it worth changing energy supplier. I think it’s fair enough that the chargers are no longer free to the general public. In fact, I actually think it may be a good thing if it makes the service financially sustainable and provides funds to improve maintenance and expand the network. However, the pricing model is all wrong. Not only is it very expensive compared to the actual price of electricity, but selling charges in 30-minute blocks just doesn’t make any sense. If your vehicle takes 35 minutes to charge, then you’ll have to buy two 30 minute sessions at a cost of £12. Similarly, if you just need a small top-up, then you’ll still have to pay for the full 30 minutes. It also doesn’t take into account the fact that their AC chargers are slower than the DC chargers and so are now effectively about 16% more expensive for the same amount of electricity. This pricing model is neither fair nor practical. It would make far more sense to charge per kilowatt hour or at least charge per minute so that the price you pay correlates to what you have actually use. It will be interesting to see how long they keep the pricing this way, but I suspect that now that they have a monopoly on UK motorway Rapid chargers, they might not have much incentive to change it. Perhaps public pressure could make a difference if it threatened their reputation as a “good” company, since this change is clearly somewhat cynical. Or perhaps it’s time for a competitor to enter this market. Whatever happens, I hope that after the amazing work that Ecotricity has done to help promote the use of electric vehicles in the UK, that this isn’t a backward step that will damage sales and encourage more people to go back to fossil fuels. 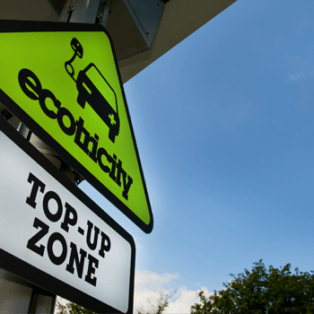 Somehow, Ecotricity needs to find a middle ground that will be profitable enough to make it worth their while commercially, while also preserving the benefits of the charging network that they have worked so hard to develop.